Explore las antiguas ruinas mayas de Lamanai, uno de los principales lugares de interés de Belice. Navega a lo largo del río Nuevo y descubre la exótica vida silvestre mientras te abres camino hacia el impresionante sitio arqueológico. Una corta caminata por la selva lo llevará a impresionantes templos, plazas y tallas de piedra enterradas en las profundidades de la selva tropical de Belice. Este tour de día completo incluye el transporte de ida y vuelta al hotel y el almuerzo en una laguna tropical. Excursión de día completo a las ruinas mayas de Lamanai. Tiempo libre para hacer turismo en la selva. 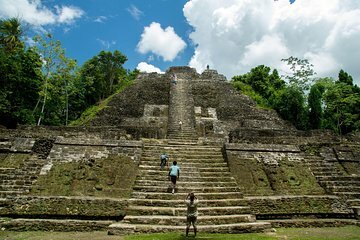 Descubra uno de los sitios mayas más impresionantes e impresionantes de Belice con este tour guiado de un día de Lamanai, que significa "cocodrilo sumergido" en Maya. Después de ser recogido en su hotel de la ciudad de Belice, pasará a través de las aldeas locales en el viaje de 45 minutos a lo largo de la Carretera del Norte. En Tower Hill, te subirás a un bote para un crucero por los pintorescos arroyos y lagunas del Río Nuevo. Esté atento a muchas especies de aves nativas, como halcones, halcones, cometas y elegantes jacanas que pisan lirios. Orquídeas tropicales, bromelias y madera dura se alinean en las orillas del río, lo que lo convierte en un hermoso viaje hacia la laguna New River. Aquí, podrás ver por primera vez las impresionantes ruinas de piedra de Lamanai que emergen de la jungla. Después de volver a aterrizar, recorra el museo de sitio para conocer algunos antecedentes de los antiguos mayas y vea los artefactos encontrados en las ruinas. Desde aquí, una caminata de 1.5 millas (2.5 km) lo llevará a lo más profundo de la jungla hasta el corazón de la antigua ciudad. Un grupo de estructuras ceremoniales aparece a través de la exuberante selva tropical, mientras que la llamada de los pájaros y los monos aulladores proporciona una banda sonora para la escena mística. Verá el Templo Jaguar, la máscara bien conservada del Dios Sol Maya Kinich Ahau, las estelas de piedra tallada, el Templo de la Máscara y el imponente Templo Alto, que se eleva por encima de las copas de los árboles. Después de recorrer las ruinas con su guía, disfrute de un almuerzo al lado de la laguna cercana. Luego, tendrá tiempo para explorar el sitio por su cuenta antes de regresar a su hotel. Our first adventure did not disappoint. The river trip guide was very informative and stopped along the way to point out a variety of animal life including crocs, bats, and birds. The Lamanai temples are pretty amazing but due to the growth surrounding them it was hard to imagine how the whole complex functioned and fit together. We were expecting lunch close to the ruins so were quite hungry when we finally completed the trip and returned to the starting point restaurant for lunch, so bring snacks! Highly recommended - an adventure. The van to pick us up was on time and comfortable for the trip to the boat landing. The trip up the river was on a smaller boat which provided the ability to stop and get close to the shore to view birds and iguanas. We saw one small crocodile. At Lamanai we heard a very loud troop of howler monkeys - then later had a troop of a dozen or so spider monkeys cross over the path between pyramids. The lunch was homemade food and was very good. Would go again. Traveling as a group of four and staying in Belize City, we were excited to tour the Mayan ruins at Lamanai. We booked our tour online with Viator before traveling to Belize. The trip was very well organized. Our particular tour operator was Discovery Expeditions and our tour guide/driver to the New River was Vel. Two others in our group booked their trip while in Belize through another company. So it seems to be random which tour operator you are assigned. Vel picked us up in a van at our hotel and drove us to the New River about an hour and a half ride where we joined several other groups and different tour operators on the boat to Lamanai. The boat was very crowded with the various guides and different groups. The boat operator was outstanding. He stopped to point out crocs and birds during the 1 1/2 hour ride to Lamanai. Once at the ruins, our group was led by Vel who gave us an informative and well guided tour of the ruins. His presentation was fun and he was very knowledgeable. We hiked to four or five different temples and ruins and were allowed to climb them if we wished. I opted to climb several of the temples that had regularly built staircases. But I truly appreciated the beauty of the sites and the wonderful explanation that Vel gave about each of them. After we had toured the sites, the boat operator set out a traditional Belizean lunch for all who had been on the boat. The food was delicious and abundant. It was a nice surprise to get such a great lunch -- it exceeded our expectations. The boat ride back was shorter -- 45 minutes. And then Vel drove us back to our hotel in Belize City. We really enjoyed our trip. It would have been 5 star except I think the boat was a little overcrowded which made it tight to sit for a long period of time and after lunch, we were only given about 15 minutes to tour the gift shops and the museum and use the facilities. It seemed somewhat rushed at the end of the day. I would definitely recommend the trip to those wishing to see Mayan ruins. What a great experience! Make sure to take your camera. You'll want to record the wildlife and the history. A beautiful country with wonderful people. We had the time of our lives. Great trip! Loved all of the aspects of the tour with one exception. The boat ride back can be quite windy as you are at full tilt on the jet boat. Loved Lamanai and all of the wild life we saw. Our tour guide Vel was great. The trip was great! The river ride was a lot of fun, and Lamanai was amazing. The guide, Vel, was ery enthusiastic, and a lot of fun. The only thing that could have been better is he could have told us more about the Mayans and what we were seeing instead of getting off on crazy tangents that didn't make much sense. All in all, a great trip, and I highly recommend it. Vel - our tour guide, was friendly and very informative with the history. Great tour.